The only first-team all-American Athletic Conference choice from last year's team, Randall has received numerous preseason honors. Among them, he was listed as a late-first-round choice in a mock 2019 NFL draft by the Sporting News. Last season, he led the Owls with four interceptions and was second on the team with 80 tackles. A strong safety, he is excellent at coming up and playing the run and also adept in pass coverage, with a nose for the ball. His eight career interceptions tie him for 11th on the all-time Temple list. Randall is among the hardest hitters on the team, and his junior season was even more impressive because he played at less than 100 percent for much of the year. A Cherry Hill West grad, Williams will use his final season of eligibility after coming to Temple as a graduate transfer from Syracuse. At Syracuse, he played in 33 games, with 21 starts. Last season, he appeared in 11 games, with six starts at free safety. He joined Temple for summer workouts, and coach Geoff Collins has been impressed with how he has picked up the system. He will be a candidate to start at free safety. 6-1, 190, R-Sr., Plant City, Fla. Injuries have marked his last two years, as Thomas has played in only seven games each season. He was working his way back from last season's foot injury at the beginning of camp and wasn't taking part in 11-on-11 or 7-on-7 drills, but Collins expects him to contribute this season. Even though he didn't start any of the games, Walls played in all 13 last year and saw extensive time, especially when the Owls played with three safeties. He had 21 tackles and, like Randall, is a hard hitter. He should be in the running for a starting spot. Temple defensive back Benny Walls (32) attempting to tackle UCF running back Adrian Killins Jr. (9) during a game last November. 5-11, 205, R-So., Norfolk, Va.
After getting in only two games last season, Bruton was among the most improved players in the spring and put himself in the safety mix. He was aggressive in the spring in both run and pass defense, and seems to have gained great confidence from that. He could start or see action in specific packages. 6-0, 195, R-So., Lakewood, N.J. He played in just one game last season but has made great strides, and stood out by making several big plays in training camp. Whether he can move ahead of many of the veterans remains to be seen, but he certainly has a future in this program. 6-0, 175, Jr., South Amboy, N.J. He started six games last season and is expected to be one of the main cornerbacks. He can defend in the slot or on the outside. Last season, he had 15 tackles and six pass breakups. Along with Randall, he is expected to be a leader in the secondary. 6-2, 190, R-Sr., Decatur, Ga.
Ya-Sin enrolled at Temple in January, after his previous school, Presbyterian College, announced it was becoming a non-scholarship football program. Playing at the FCS level, he excelled with a school-record five interceptions and 49 tackles. He has been among the most impressive newcomers and has apparently picked up the system quickly. He likely will be starting at corner, and NFL scouts are well aware of him. 6-0, 175, R-So., Penns Grove, N.J. He played mainly on special teams and took part in seven games last season, but Brown should have a much greater role this year. He enjoyed a strong spring. 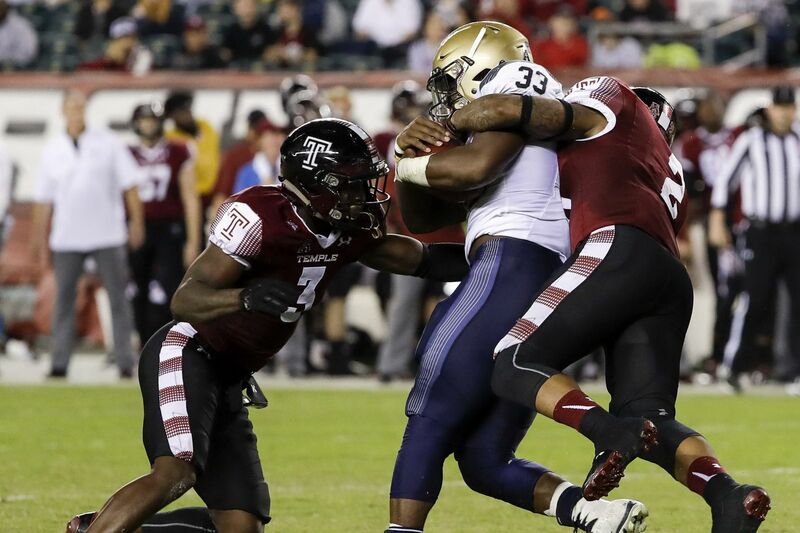 When Temple goes to a nickel defense, he could be the third cornerback. Early in training camp, Collins praised Braswell for his solid play and improvement. He will be in the cornerback mix, especially with his speed. In high school, he ran the 100 meters in 11.40 seconds. 5-10, 185, R-Fr., Silver Spring, Md. Along with Braswell, Mason was cited by Collins when talking about the cornerback competition. Also a track standout as a sprinter and long jumper, he long-jumped 23-11 in high school. He had a strong game in the Owls' final team scrimmage.